A sprinkler system is one of the most effective tools available to prevent the spread of fire in tall buildings. Grenfell Tower and thousands of others in the UK do not have sprinklers installed. Reality Check explores the reasons. Regulations in England mean that only buildings constructed since 2007 and which are taller than 30m are required to have sprinklers fitted. This requirement wasn't applied retroactively so did not apply to Grenfell Tower, which was built in 1974. Existing high-rises in England must have them fitted if a fundamental change is made to the structure or use of the building. These regulations are the same in Northern Ireland. In Scotland all new residential buildings taller than 18m must be fitted with sprinklers. In Wales since last year, all new and refurbished residential accommodation must have sprinklers. Nowhere in the UK is it a requirement to retroactively fit sprinklers in existing buildings. This tragedy has brought back memories of other fires in high-rise blocks and warnings ignored. The World at One has looked into what recommendations were made in the past. 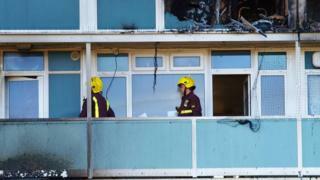 After a fire at Shirley Towers, Southampton, in 2010, which killed two firefighters, the coroner said: "Social housing providers should be encouraged to consider the retrofitting of sprinklers in all existing high-rise buildings in excess of 30 metres in height." In 2005, a fire at Harrow Court in Stevenage, Hertfordshire, killed a woman and two firefighters trying to rescue her. The Hertfordshire Fire and Rescue Service report recommended the UK Fire Service should explore options for high-rise buildings, including the "provision of sprinklers". After six people died at Lakanal House in south London in 2009, the coroner said "It is recommended that [the Department for Communities and Local Government] encourage providers of housing in high-rise residential buildings containing multiple domestic premises to consider the retrofitting of sprinkler systems." Fewer than 1% of council tower blocks are fitted with sprinklers - so what does it cost to fit a new sprinkler system in an old building? Sir Ken Knight, the author of a report on the Lakanal House fire, said that while there was significant evidence of the effectiveness of systems such as sprinklers controlling fire spread in buildings, it was not considered "practical or economically viable" to enforce the retrospective fitting of fire suppression systems to all current high-rise residential buildings. The British Automatic Fire Sprinkler Association (BAFSA), the trade body for the fire sprinkler industry, said retrofitting Grenfell Tower with sprinklers might have cost £200,000. This is the figure for installing a sprinkler system but does not include potential maintenance fees or costs associated with the wider redevelopment of a building. Costing will of course vary from building to building. After the Shirley Towers fire in 2010, it cost the council £1m to install sprinklers in three tower blocks. The cost can be high because in blocks made of concrete and steel like Grenfell, the process is difficult and time-consuming. So the focus has been on other measures which would contain a fire to stop it spreading. However, Roy Wilsher, chair of the National Fire Chiefs Council, said it is "certainly something we need to look at again". He also said that if the fire spread up the outside of a high-rise, as it is reported to have done at Grenfell Tower, then sprinklers might not have made a difference. The Grenfell fire was similar to one that broke out in Dubai in 2016 - the difference is "that building had sprinklers and nobody was killed", according to Alan Brinson of the European Fire Sprinkler Network. In 2015, a spokesman for the Chief Fire Officers Association said that nobody had ever died in a fire in the UK in a property with a "properly installed sprinkler system working the way it's meant to".